Triple Crown Silver Pole at a Great Price! *Weight is of the pole without brush, tubing, or other accessories. ** Stiffness is a subjective measure for comparing our poles to each other. Looking for a little extra height? Pole comes with the fittings you need to hook up your pole to a pure water cart. Both the quick-connect hose fitting and the quick-connect shut-off valve are included. The shut-off valve connects to any standard male garden-hose fitting. I purchased the 45' pole and have used it over thirty times. I am satisfied with the pole, yy only complaint is the clamps and how they function. Much more durable than some other poles I own. I like the new adjustable clamps that don’t need an Allen wrench to tighten. This is my 3rd silver pole and I find them to be stiff enough and light enough to get the job done. I also own several other brands of poles which tend to splinter and stick pieces of carbon fiber in my employees hands. They all seem to prefer the silver pole. 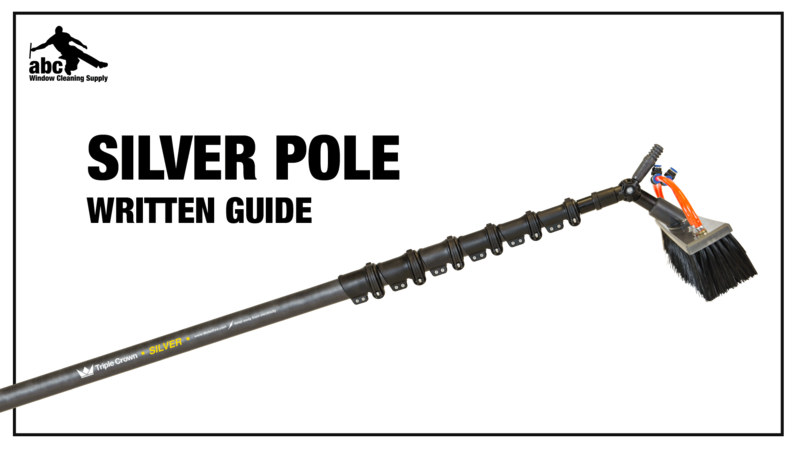 I don’t like that the silver pole metal tip is a different size than the modular pole. I seem to always haveThe wrong one. As I own several of each type. The 10ft pole rocks, but the 35ft pole I got also is ok, best if used 28ft and below. Its a noodle when fully extended which is why I'm saving up for a Gold 47ft hi-mod carbon fiber pole. I'm still learning and will continue to support ABC due to there customer service and help they have giving me. I just wish I didn't go cheap and bought the SG2 with the Hi-mod poles. We live and learn!!!! I have the 35' Hybrid pole. Pole is great I also own a 60 ish silver and a 60 ish modular carbon fibe which I love but it’s very fragile and only used for specific applications. The silver is great for daily use. I've used this pole more than 30 times. I'd suggest replacing plastic clamps with aluminum ones and all plastic all together the plastic goose neck that it comes with is destined to break. Great design for every day use. I have the 35' Hybrid pole. One suggestion would be to make it oval to reduce twisting. I own the 35' Carbon Fiber pole. I've used it more than 5 but less than 30. I don't have any suggestions to improve this pole. I have the 35' Hybrid pole, and I don't have any suggestions at the moment.